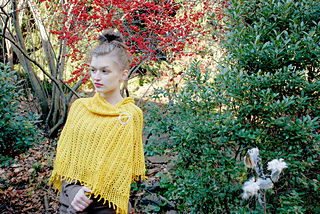 The Ginto Shawl is knit from the top down and features a Faroese-style center panel for the spine of the shawl. 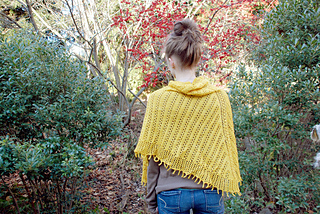 It’s a large sized shawl that can be worn in a variety of ways. 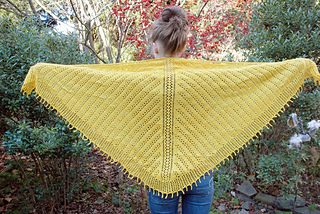 The body of the shawl has a simple lace pattern that appears to radiate from the center lace panel. 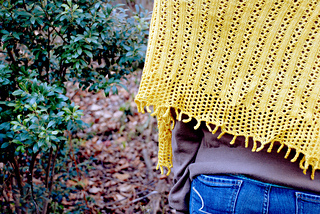 The picot bind off gives the shawl a decorative edge. Finished Size 64” wide and 29” deep. 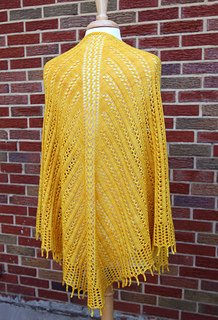 Yarn Anzula Squishy (80% superwash merino, 10% cashmere, 10% polyamide; 385 yd 352 m/ 4 oz 115 g): saffron, 2 skeins. Needles Sizes 6 (4 mm) and 7 (4.5 mm): 40” circular (cir). Adjust needle sizes if necessary to obtain the correct gauge. Gauge 19 sts and 35 rows = 4” in Double Lace Rib with smaller needles, blocked.